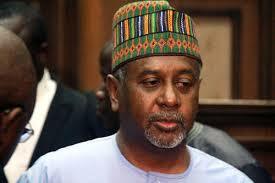 More trouble is on the way for Nigeria's embattled former National Security Adviser, Col. Sambo Dasuki. According to a report from The Nation, Dasuki's office has been fingered into how $40 million, procured for negotiation with Boko Haram with an aim to release the kidnapped Chibok girls, disappeared. ”The government is probing how about $40million was allegedly spent by the administration of ex-President Jonathan to ‘negotiate’ with Boko Haram. The cash was allegedly withdrawn from the ONSA account by a former presidential aide," someone close to the investigation reportedly said. “The said aide alleged that the cash was routed through the Presidents of a neighbouring country, but preliminary tracking showed that the money might have been diverted. “Many people have been linked with the negotiation, but the government, through relevant anti-graft agencies, is trying to ascertain the whereabouts of the funds. We have started inviting those connected with the deal for interaction. “Even the ex-President in January 2016 said in an interview with a news website, Quartz, in Geneva, Switzerland that his administration did not set up any negotiation team.